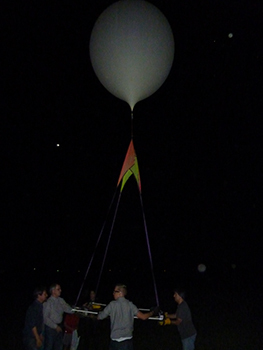 We participated in a high-altitude balloon (HAB) launch recently. This was a night launch and our goal was to capture images of night-time illumination on the ground. We planned to test the low-light sensitivity of some off-the-shelf imaging systems to define a basic performance benchmark for the NITESat nanosatellite mission. We were testing a hacked GoPro 3 which would take high resolution images every minute or so, a hacked Canon point-and-shoot which would also take images once a minute, and a GoPro 2 which was taking standard video. We used the same image stabilization frame to support the cameras and GPS’s as we used on the evening launch last Spring. The wider axis increases the moment of inertia and gives us less crazy spinning on the video. We arrived at our usual airfield at Koerner Aviation just around sunset. The overcast skies produced a pretty sunset, but did not bode well for getting any good ground imagery from the HAB. 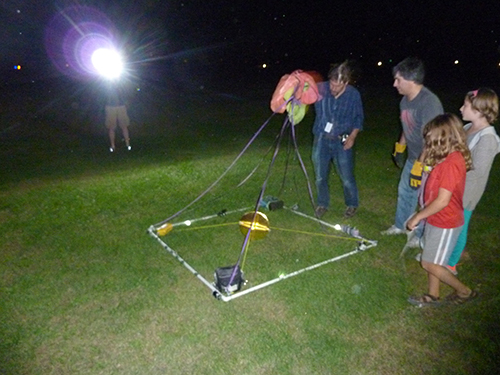 The launch went well and our balloon and stabilization frame disappeared up into the inky blackness. Ground winds were pretty light, from the south east. The HAB followed the predicted path pretty closely, wandering around in a sort of confused, clockwise spiral as it ascended, eventually tending to the south west. The burst happened at over 97,600′. The descent was pretty rapid and followed a similar winding spiral, this time in a counter-clockwise direction. The overall flight path was pretty short. The total downrange distance was less than 10 miles. The strobe lights attached to the stabilization frame allowed us to make visual contact while it was still at about 2,500′ and we tracked it to a landing in a cornfield. The landing site was less than 100 yards from the road. We had a strong signal from the beacon transponder, which allowed the recovery team to easily walk right to the HAB. The strobes made it easy to find in the dark and amidst all the tall cornstalks. We had mixed results from the imaging experiment. The cameras taking still photos were angled more downwards and didn’t capture much at all. 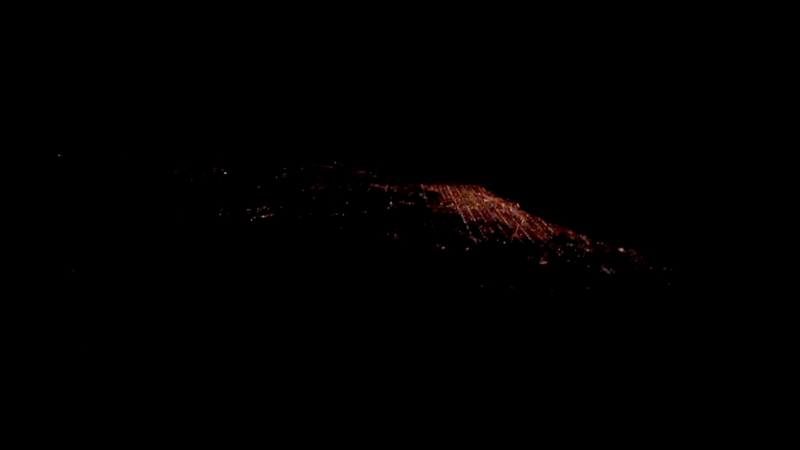 On the video, we had a good view of the lights of nearby Kankakee until the vehicle entered the cloud layer. Once the HAB rose above the cloud layer, it turned out the clouds were clear over Chicago. The video camera was positioned at more of a side angle than the still cameras. At altitude, we had a good view of the lights of Chicago, about 60 miles away. A careful inspection of the imagery reveals that not only the intense lights of the city were captured, but lights in some rural areas were visible as well. The mission was able to successfully demonstrate the capture of night-time illumination from over 97,000′ using off-the-shelf components. High-altitude flights to the stratosphere approximate some of the conditions we’ll encounter in the harsh environment of low Earth orbit, including night-time illumination, low temperatures, and near vaccuum. We expect to do further HAB testing of components for the NITESat mission in the future. Copyright © 2014-2018 Orbital Transports. All Rights Reserved.